Interaction Advisory Group has partnered with the UAB School of Health Professions to provide law enforcement with customized training to help officers better recognize and respond to people with special needs. The Recognition and Evaluation of Autism Contact Training (REACT) program, a unique public-private partnership, offers all the educational instruction online so it is accessible to any law enforcement department across the United States. The peer-reviewed curriculum was designed by a committee of UAB professors, academic instructional design specialists, law enforcement experts and authorities in various areas of special needs in order to meet the highest standards of academic excellence. The online training is asynchronous – meaning the course is custom designed specifically to be self-paced and learned without instructors present. The interactive design allows the program to directly assess each learner’s knowledge. This method of online learning ensures the information is being fully understood at a level of clarity where the trained law enforcement officers can immediately react and apply the lessons learned to their daily interactions with all people. REACT is the authority in asynchronous online special needs training. The unique ability to customize the curriculum to meet your department’s needs, while keeping it affordable and accessible to everyone, sets this program apart from all others. If you or your department or organization are interested in training, please click here to contact us so we can customize a program for you. 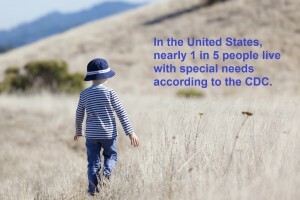 According to the Autism Society, “more than 3.5 million Americans are living with an autism spectrum disorder.” And when you consider a study by the Centers for Disease Control and Prevention says 1 in 5 adults in the United States has a disability, the chance of law enforcement personnel encountering an adult with special needs or a disability increases everyday. The need for the REACT training is real and it is immediate for both law enforcement and the public they serve.